Many local recording artists dream of breaking through with something fresh, original -- and non-Jawaiian. Inner Session is one such group. Their debut album, an engaging collection of acoustic rock originals with a jazzy slant, deserves a hearing. Keao Cockett, Sean Carroll and Nakana Wong are the dream chasers. Between them, they play piano, guitar, drums and acoustic bass, and their producer, Dr. Trey, upholds that basic sound throughout. Although he brings in some other musicians and makes some musical contributions of his own, the good doctor never misrepresents what the trio is capable of doing themselves. Soft but steady grooves, articulate lyrical images of everyday life and nicely understated arrangements make these dreams worth sharing. 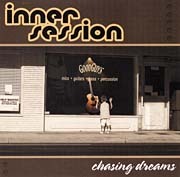 The trio dispenses with music entirely when revealing the meaning of their name on the cut "What's an Inner Session?," and show they have a sense of humor as well, as displayed by the album's cover art. The title song is one of 16 pop standards Herb Ohta interprets on this collection of newly recorded gems. Ohta-san can certainly hold his own as the leader of a jazz combo or as the featured soloist with a larger group, but his work is best appreciated when he's by himself. That's the case here. Each chord, every individual note, resonates with crystalline clarity. 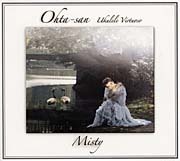 Anything Ohta records can be described as "romantic," but these recordings offer a particularly fine showcase of his artistry and technique as a musician and arranger (that "second musician" that's heard in places is Ohta-san overdubbing himself). Fans, scholars and aspiring ukulele virtuosos will also find listed the tunings he uses and the brand names of the ukes he used. His iconic status aside, Ohta's cosmopolitan repertoire almost guarantees that each new album of his will introduce the listener to at least one unfamiliar melody. For some, the new discoveries may be of lesser-known 20th century American pop tunes and for others, European or Latin American hits. To help educate the listener, a brief history of each song is included in the liner notes, along with technical information about the way Ohta puts his personal stamp on each.